Facebook can be the best social media platform for businesses of any size. But it comes with a huge price tag. Facebook Page reach is heavily determined by several factors and the biggest one is paid advertisements. Reaching a bigger range of audience using Facebook profiles (on the other hand) is determined by your follower’s engagement with your posts. In short, Facebook can be really a pain-in-the-a*s for marketers. Some even called it a social media marketing nightmare! What would you do if you hate Facebook? Which other social media platforms you should be spending your time, effort and money? In this article, I will be sharing four other social media platforms you should highly consider, plus the pros and cons of each. I love Twitter more than Facebook (seriously). There is an estimated 58 million tweets shared in a single day. Yes, that’s a whopping 58 million with 6 zeros. Just like any other social media platforms, Twitter isn’t that easy to master and leverage. It does take a specific approach to achieve the desired outcome. Make no mistake. Twitter isn’t bad; it is just challenging. Influencers such as Kim Garst and Rebekah Radice are doing perfectly well on Twitter because of various reasons. One of them is providing tons of value to their followers. Twitter can make or break a business. 140 characters is extremely limited and social media marketers are required to craft the perfect tweet almost all the time to ‘tick’ their followers. While Twitter is free to use, there are also Twitter Ads features which you can pay to reach to a bigger chunk of audience (hint: imagine Facebook ads). See also: How To Determine The Type Of Tweets To Publish? Is your business focusing on millennials? If you do, you got to use Tumblr. Tumblr is often considered a blog where you can share literally anything under the sun. It is free to create and you can gain a huge following especially when you are sharing popular topics and information (some sort of the viral effect). As of 2014, Tumblr recorded a huge, 470 million users and as of this year, there is approximately 217 million blogs hosted on Tumblr. Also, your success using Tumblr is highly focusing on accessibility. Always make sure that you make it extremely easy for your followers to link up or follow your Tumblr blog (cross sharing on social media). LinkedIn is the home for B2B marketers. If you are running a business, you got to be on LinkedIn. If you are, STOP right now. Head over to LinkedIn and create a free account now! As of today, there are about 380 million LinkedIn users. That’s a huge number when it comes to business opportunity, to say the least. LinkedIn isn’t just a social media platform. It is a place where professionals meet up, discuss and engage with each other. Of course, you could also use LinkedIn to find for job opportunities (no pun intended). Let’s be real honest. LinkedIn isn’t your average social media platform. It is a platform for marketers and businesses. While LinkedIn may be one of the hardest (and most challenging) social platforms to leverage, achieving success in it would lead to countless opportunities in revenue, lead generation and potential customers. Yes, it’s Google+ (or Google Plus). It is not dead and for those who say that it is dead, think again. For starters, Google is often testing with newer products and tools. The company has poured a huge chunk of effort (not including advertisement) in promoting the platform — and this means that Google+ will still stay for at least a while more. But wait! What about Google+? As for the record, there are both die-heart supporters and Google+ haters in the world. On the personal note, I don’t see any reason or possibilities for Google to ditch the platform completely. And because of that, I see no reason why marketers should be spending at least some time on Google+ for multiple advantages such as better SEO ranking and engagement level. See also: How To Use Google Plus Like A Professional? 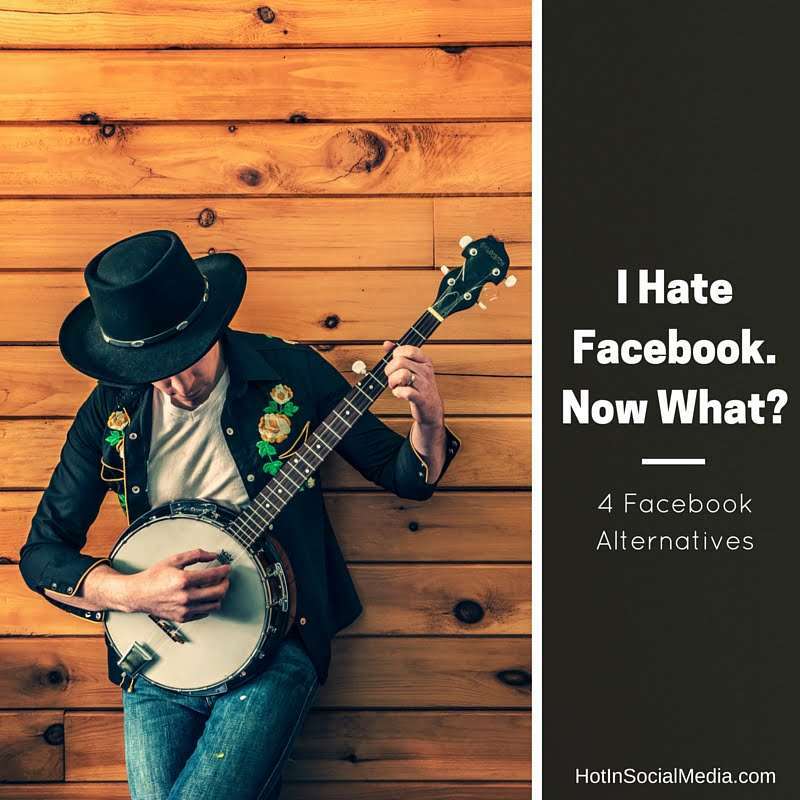 The above are just 4 simple examples of Facebook alternatives. Do you have a specific preference? Leave a comment below and tell us about it!